So this is definitely going to be a long read, but I have found that sitting down to write out all of this information is actually quite relaxing and helps to bring closure to the day while creating targets and objectives for the next year. On the upside: there are pictures! In the end I wonder which took longer – the race or writing up this report. 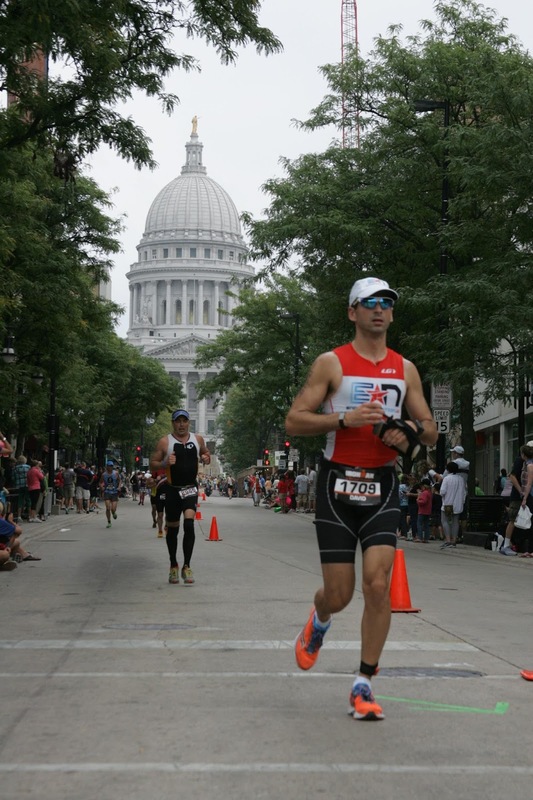 The short version: I had a absolutely fantastic time racing in Madison this year. I PR’d by about 8 minutes and had fun for about 136 of the 140.6 miles. 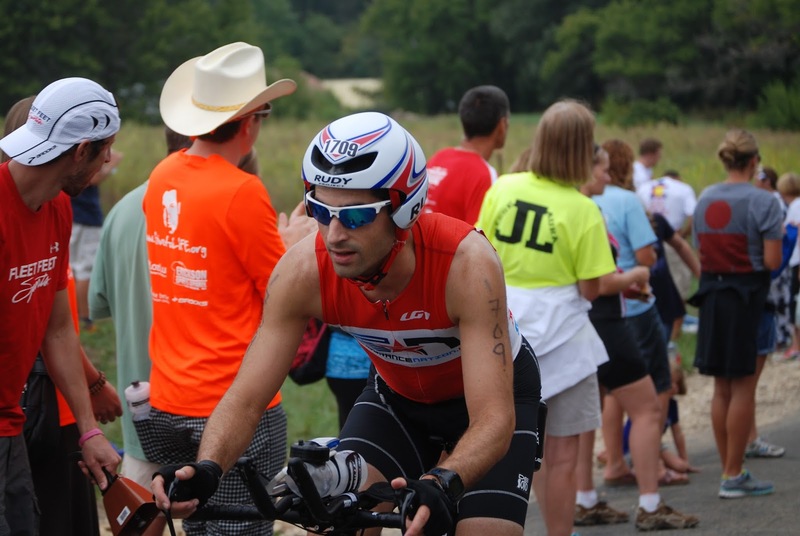 I had really focused on training and trying to rebuild myself and my ability to race in triathlons after last summer’s misadventure during the Racine 70.3® when I was hit by a car and separated my shoulder. 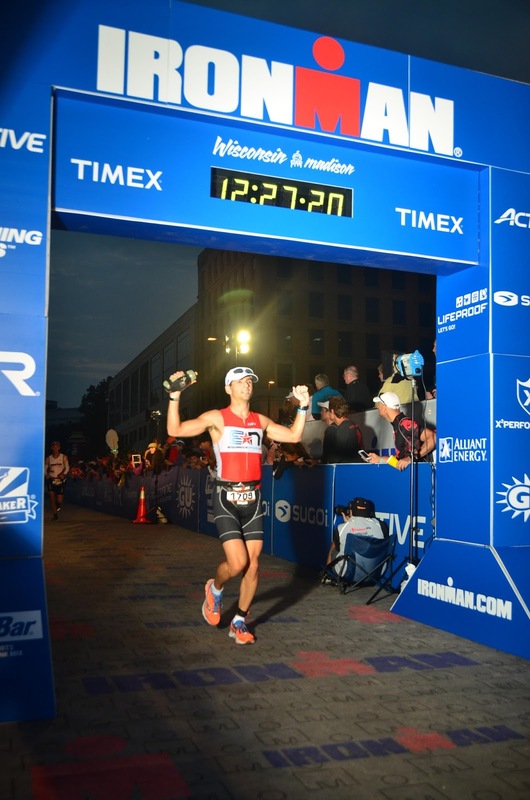 While there were many major victories along the way, Ironman® Wisconsin was the ultimate goal – get back to the starting line and finish the race, hopefully faster than before. I trained, finally bought the new bike that I had wanted to get for some time, outfitted it with new wheels and then trained some more. I got to meet some awesome people at a training camp in August, at other races during the year, and then training locally as well. Most importantly during the final month leading up to the taper I truly had a wonderful time training and getting ready for this race. 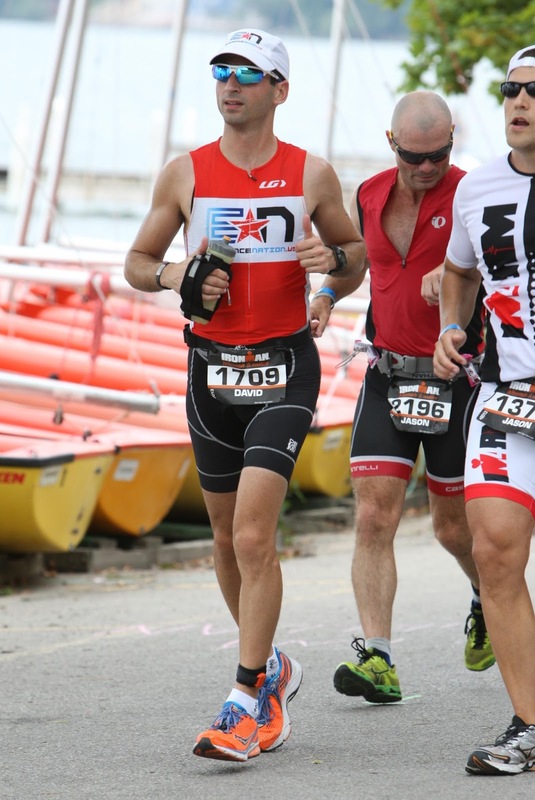 In the week prior to the race I was seriously suffering from some awful ironmanitis. This is the disease process that only occurs during the final stages of the taper and manifests as everything in the body that has not hurt at all during the hours and miles of intense training in the months prior all of sudden starts to hurt. It can be joints, bones, muscles, anything and everything really. The key element of this diagnosis is that there is nothing actually wrong, it just feels that way. The only other similar physical ailment is a “mancold”. 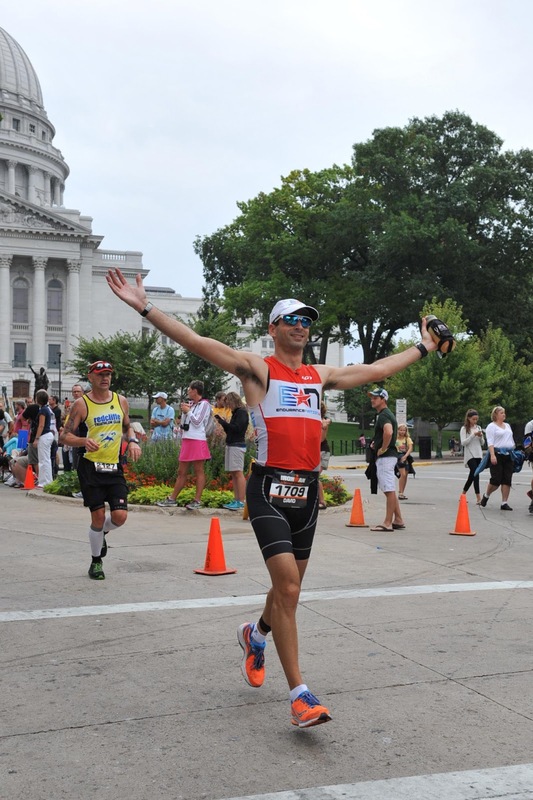 I arrived in Madison on Thursday afternoon, walked through a nearly empty registration process (the easiest and swiftest I can ever remember this being), checked into the hotel and made my way to the team EN dinner and caught up with friends from the EN camp and other races this summer. Friday morning was a relaxing swim. Followed by the 4 keys talk and then lunch with a group of my non triathlon friends who live in Madison. Friday afternoon was one final check ride of the bike, brakes, and body. At the end of the ride, things felt good, I was confident, I went back to the hotel, relaxed in bed for a little before my parents arrived. Saturday was purely admin and relaxation. Bags packed, bike ready, off to transition, lunch, nap, dinner. I was in bed by 8, asleep by 9. I slept ok the night before the race, actually fell asleep and then woke up at 2:45, drank 275 calories of Infinit, went back to sleep, woke up again at 4am. Another 275 calories of Infinit, bagel, cliff bar, got dressed, made sure I had all of the bottles and computers etc, special needs bags and headed down to the Terrace. Pumped up tires, got computers all set up, made stop in bathroom and then headed down to the swim start to meet the team. I met up with my parents for the first time that day, took a quick picture before I headed down to the water to start the day. While I was out on the course for the entire day they too had a game plan of different places to meet me and cheer me along and take pictures of my journey (many of which are included here). 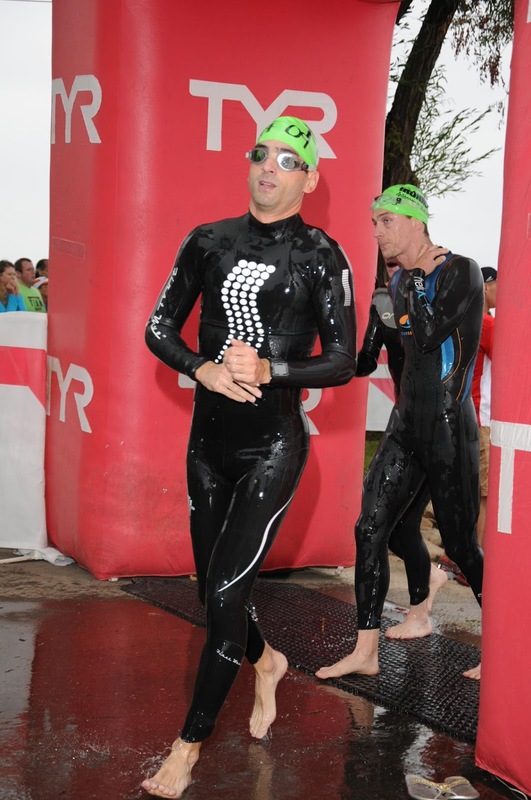 After hanging out with the team, I finished up my bottle of Gatorade, got wetsuit on, and headed down to the swim start. I got in the water around 6:40 and warmed up a little, treaded water, drifted down towards the ski jump, and just chilled out. My original intention was to start just on the shore side of the ski jump based on previous races there. As I was floating it seemed as if the buoy line was still quite a way out from shore and I wanted to swim the straightest line possible…while not getting totally clobbered on the buoy line, so I migrated even further from shore. At 6:55 I was about halfway between ski jump and about 3-4 rows back from the start positioned around people who planned to swim around a 1:10. Mentally, I was ready, totally calm and yet incredibly excited. I couldn’t believe that it had been 4 years since I had last done an Ironman, it honestly felt like it was yesterday. The emotions and the excitement of treading water surrounded by 2500 other people was absolutely amazing. My thoughts quickly narrowed and as I saw the time ticking down on my watch was getting ready to fire the engine and start the journey. 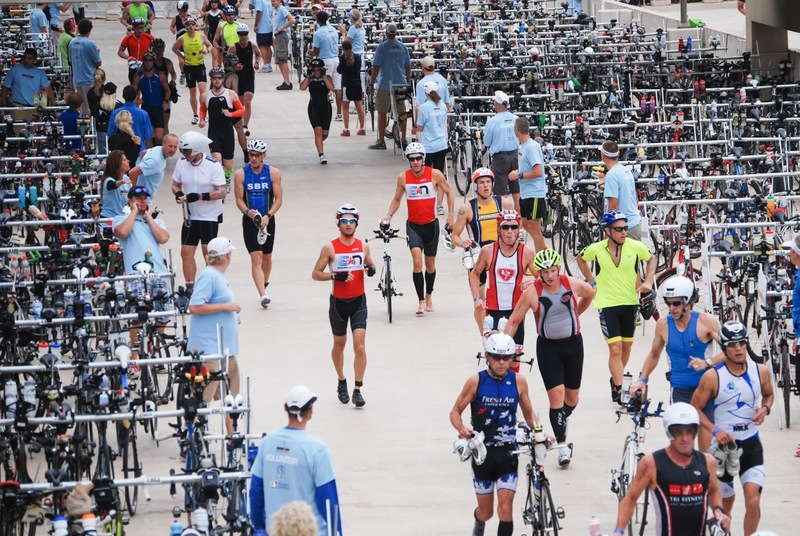 The minutes prior to the mass start of an Ironman® are incredibly surreal. The joking and chatting slows and the only noises heard in the minute prior the race is the sound of water moving around the bodies of the competitors. 7:00 BOOM!!! the cannon fires. I start my watch, lock the buttons, and begin the journey. There was some contact, about the amount I was expecting. Got kicked in just about every part of my body, including some places that I just didn’t know it would be physically possible to be kicked in while swimming. I stayed in a nice and relaxed rhythm, counted strokes, maintaining my breathing pattern and trying to stay close enough to the buoy line, but far enough away to avoid the majority of the scrum. The entire first leg of the race was downwind and I hit mile #1 (according to watch) in 27 minutes, not working hard at all. After the obligatory MOO at the 1st turn buoy I made the left turn and then back up the other side after the second turn. The long length of the rectangle on the far side of the course was entirely into the wind, with probably around 1 foot waves. The waves made sighting a little more challenging and breathing more interesting. 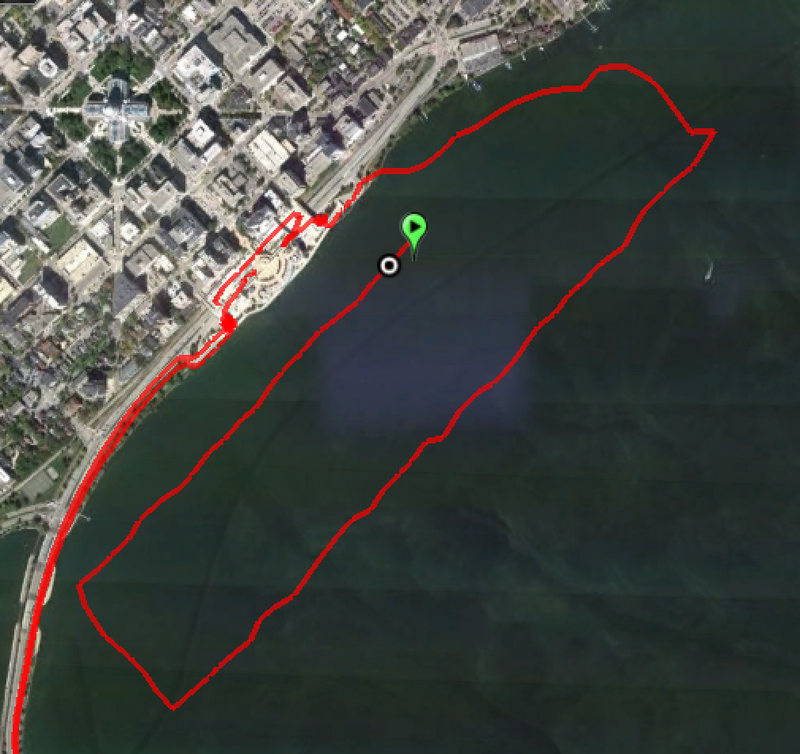 I just tried to envision this as any other training swim in Lake Michigan where I have to contend with all sorts of water conditions. I knew that I had swam in far worse conditions and mentally this was very helpful. I was ok with swimming a little slower to maintain some element of form, keep my breathing under control, and stay relaxed. I made the turn home which I found to be the hardest leg of the entire course. 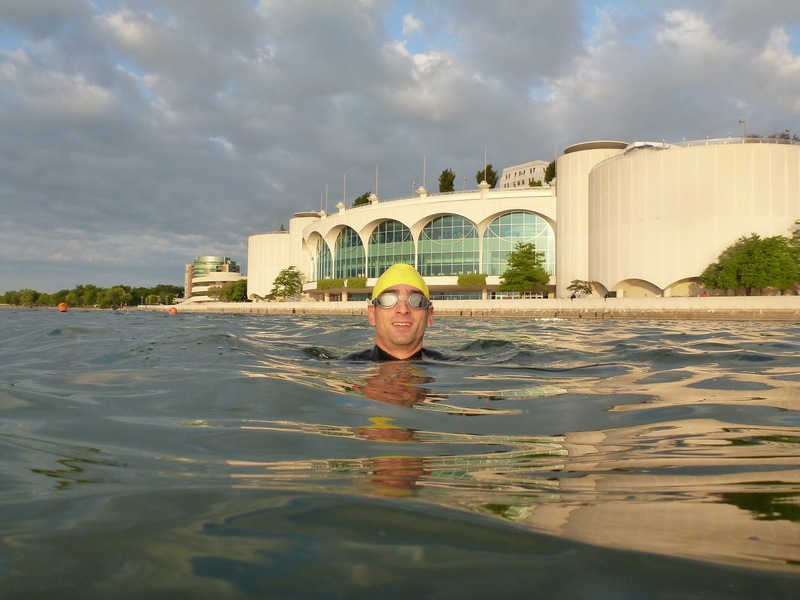 Even though I had some buildings and a big giant helix to sight off of, I just couldn’t get my bearings on the final leg of the swim. Regardless, I hit the shore at 1:12:39 which was right on target. I am extremely happy with my time, about a minute slower than 4 years previously. HOWEVER, 14 months ago I couldn’t move my left shoulder due to a Grade III AC separation, the water conditions 4 years ago were perfect, and based on the data at runtri.com – it seems as if the overall swim time average was about 4 minutes slower than previous years (likely due to the wind and water conditions). Total Swim 1:12:39 and 66th for age group. Honestly, the run up the helix is probably one of the coolest things I have experienced in any triathlon I have ever done. 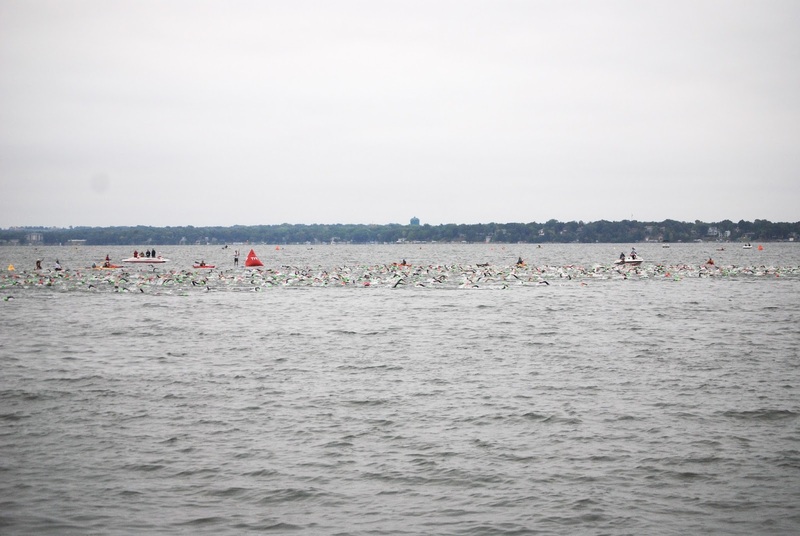 Running out of the water up the circular structure surrounded by hundreds of cheering competitors is incredible. I grabbed my gear bag, shoes, socks, helmet, sunglasses and I was off. Nothing really all that exciting here. Off to the bike, grabbed bike saw Bruce Thompson, mounted bike and started the 112 mile ride. 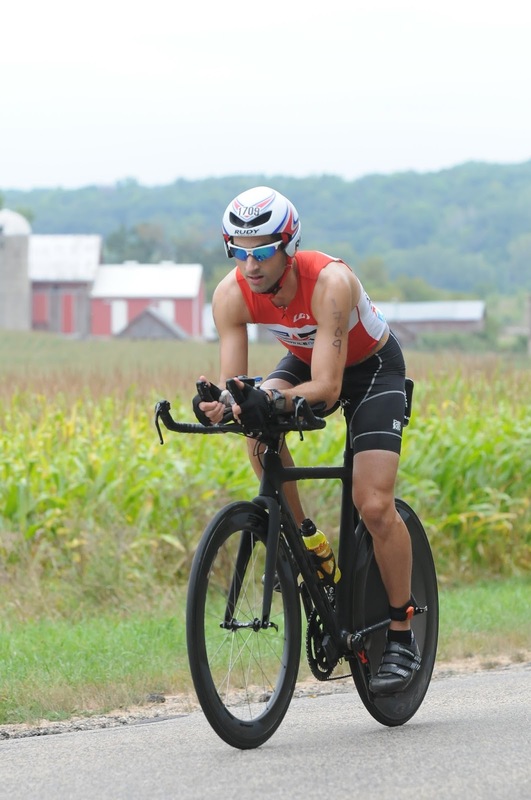 I had what I thought was a pretty well defined and refined game plan for the bike based on riding the course innumerable times in training, during previous races, and during the EN camp. The goal was to have an IF of around .71 for the ride (FTP of 218 / Race weight 140, wt/kg of 3.4). I was going to drink around 9 bottles of perform (180 oz of fluid, 1575 Calories,) 1 cliff bar 270 cal, and then sips of water if needed. I figured based on training rides, and previous IM times at MOO I should ride around a 6:10-6:20 and keep the watts in the right place. This year I completely changed my nutrition strategy. 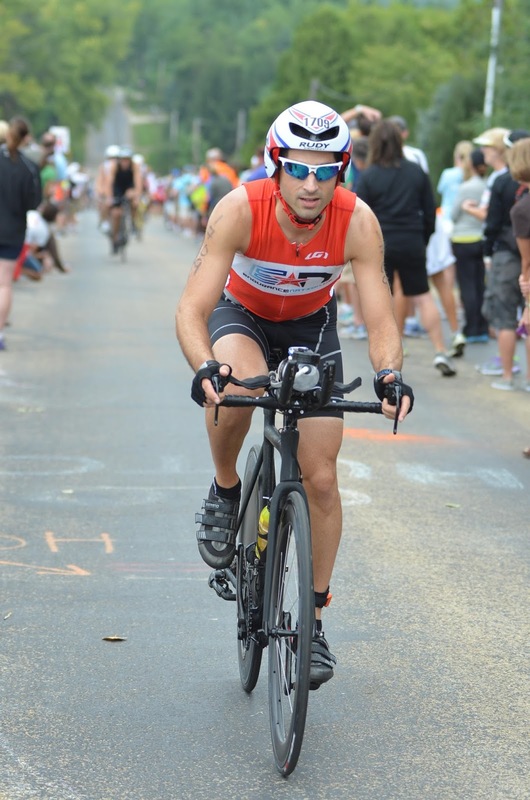 In the past I had been an Infinit user (still am in certain situations) but found that during the last race my stomach basically shut down and I stopped digesting around mile 70 on the bike…it made for a long and uncomfortable marathon. The ride started out great, I was cruising along, focusing on getting my nutrition in and just trying to ride steady. I didn’t really feel as if I was working at all. The wind at my back was clearly helping with that feeling too. I laughed a little at the first hill on Whalen when people were already getting out of their seats, standing, and climbing in the big ring up front. I was spinning up and biding my time. I kept looking at my numbers, watching the power on the laps that I had set based on training (Terrace to Whalen/PB, Whalen PB/Cave of the mound sign just before climb into Mt Horeb, sign to right turn on S, right turn on S to top of 2nd Garfoot, 2nd Garfoot to cross plains, cross plains to top of midtown climb, top of midtown to Whalen/PB) This division has helped me with the climbs and descents to keep power steady. The spot checks suggested that things were going ok. The climbs up the 3 hills were steady, relaxed, spinning the best I could. Overhead a couple positive comments from people on Old Sauk that I was riding nice and steady and looked relax. Even heard one person (not sure if EN) say, “nothing matters until mile 18”. The crowds up Old Sauk, Timber Lane, and Midtown are awesome. Between the devils at the start of the Old Sauk Climb, the clown in the corn field, the guy with the sign that said “follow me I know a short cut”, the Prom Queen (Ian Kurth’s wife), and everyone else in all sorts of fun costumes on Midtown, there is definitely a lot of fun and amazing crowd support. Peed twice on the bike during the first loop, nailed the nutrition goals, stomach felt fine, legs felt fine, on the second loop. Got all of the bottles at aid station, didn’t miss any. The athlete guide and the pre-race briefing all said that each aid station would be fully stocked with everything. My experience in the past was that the aid station on sugar river rd was water only. So, at the aid station on Whalen I racked 2 bottles just in case. Sure enough, no perform at the non-advertised water only stop. Again, planning and experience are helpful. As I was making the turn back onto Whalen I did a quick spot check of the ride data file to that point. I cycled through the screens to see how I had been doing: 56 miles 3:05, avg power 147, avg HR 143, seemed to be right on target. Then I saw an IF of 0.8, uh, oh. Really, I mean really? So it was at this point during the race that I probably made the most intelligent and important decision of the day. I chilled out. I rode up hills even slower, stopped at aid stations for nature breaks, stopped pedaling at 28 instead of 33 mph on the downhill and figured that I would add about 15 minutes to my 2nd loop but that it could save me 30 minutes or an hour on the run (maybe more) I figured that part of the high IF was probably due to me not riding steady and probably (despite riding in small front and 28 cassette) still needing too much power to get up steeper hills despite riding slow. Turns out, the IF wasn’t that high, probably closer to 0.75 according to WKO+, but still too high for my race plan – Avg power 147, HR 143, Cadence 81). The second half of the ride highlight was heading up Old Sauk the second time with J.T. Thompson running and cheering along. JT – your energy was awesome, but really challenged me to “stay in my box” at that part of the climb. Seeing my parents on the Timber Lane Climb was also fantastic! It was great seeing you out there. I rode the second half of the ride in 3:14, IF was 0.68 (looking at WKO+ now) Avg power was 132, HR 129, Cadence 80. The reality is that my VI sucked for both the 1st and second half of the ride, just over 1.14 for both. I knew it would be bad for the second half because I chilled out on my riding, somewhat annoyed that it was awful for the whole time. Honestly, I think the one thing that I really need to do that will help to smooth this out is to get a compact crank. It is on the list for additions for next year. The final section of the ride was fine, I actually felt strong, relaxed, hydrated, topped up on nutrition and ready to go for the marathon. As strange as this sounds, I was actually looking forward to the run. I really tried to ride the last 16 miles as steady as I could. I let everyone go by me on the last climb on Whalen and then caught each and everyone on the downhill. I finished the ride in 6:19:22 in 117th for AG. Right on target. After cruising on up the helix I ran into transition, grabbed my bag, put on socks, shoes, grabbed hat, race belt, quick stop in bathroom and I was off. Volunteers as usual were great, nothing exciting. My goal for the marathon was to run as much as possible, walking at the end of each aid station and to just go out for another long run. 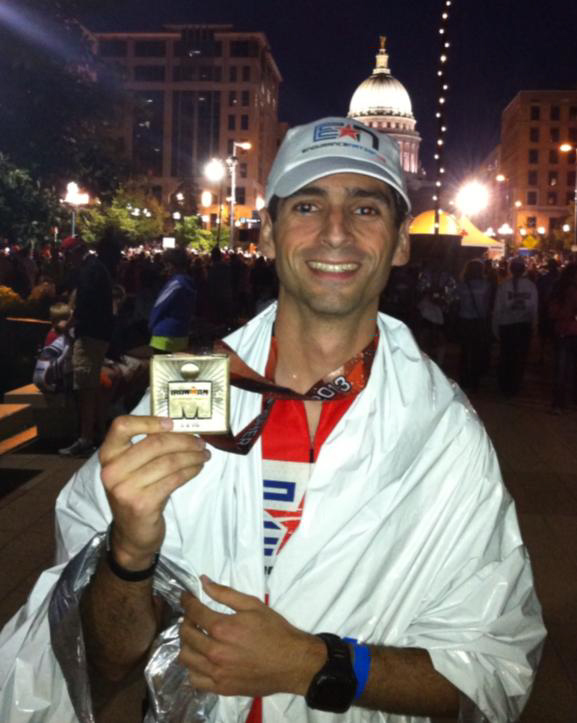 In 2008 my marathon time was 4:49, in 2009 it was 5:07, there was opportunity for improvement. I started out running, kept my pace in check, told myself several times to slow down. The goal: 9:30-9:45 for the 1st 6 miles, then if feeling good closer to 9:30, if not feeling awesome then just try to minimize slowing down. I carried a Nathan hand held bottle, filled it up with ½ cup of perform + some ice at every aid station, drank as I was running in between aid stations. Added 1 packet of gu chomps and then some coke and chicken broth after about mile 20. I saw my family at the start of the run and said hello. 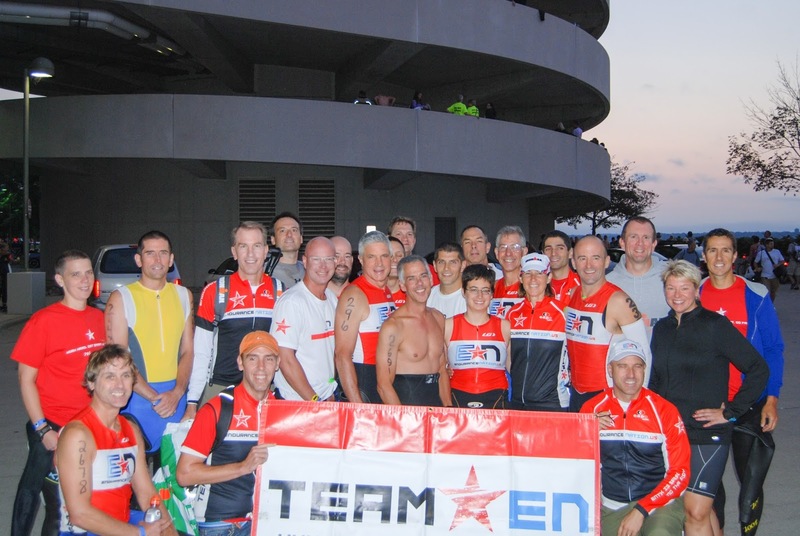 It was awesome seeing the EN support crew at the tent at the start of state street. Unfortunately for whatever reason my Garmin did not download my run splits (sad panda) so I am going entirely off of the splits from the ironman site for the post race discussion. My splits put me at 10:25 min/mile to mile 5.9, 9:37 to mile 9.9 and 9:51 at the half marathon. I will be believe the half marathon average, the others I am not sure about. I saw my parents ever several miles on the run at our designated meeting spots and each and every time I gave two thumbs up with a smile and said that I was feeling great, which really was true. I was doing ok until right before the 2nd trip up observatory hill. I started to get a side stitch, felt a little nauseated and knees started to bother me. Well mile 18, here you are, didn’t really surprise me too much. So I walked up the hill, tried to just chill out a little and then started moving again. Saw my parents again on state street and for the first time during the race was in a really dark place and didn’t wasn’t all that happy about racing anymore. But I figured I had made it that far, I could just keep on running/walking/refueling and make it eventually. Hit the 20 mile marker, knees were screaming at me, every cycle of turning over legs just felt awful, tried to stretch out a little, very difficult to do for joints… The run became a run/walk, but I was still moving forward. I switched over to cola and chicken broth hoping they would both help to settle my stomach. It seemed like it worked. Or the extra sugar/caffeine in the cola worked, one of the two, the cramp in my side and the upset stomach seemed to go away. 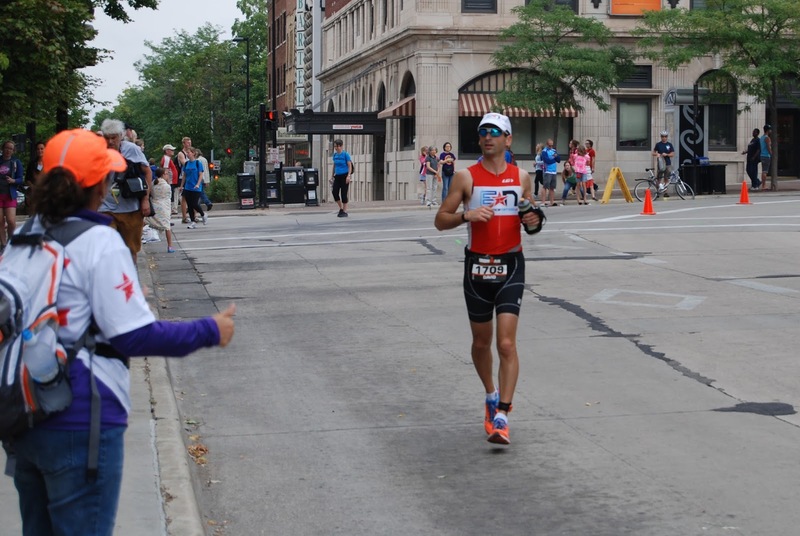 One of the best parts of the race was seeing someone in an EN jersey about every 5 minutes on the run, really kept me motivated. Jason Mason and I went back and forth for a good portion of the 4 miles from 20-24 and it was nice to have some motivation back on that part of the course. I finally hit mile 24 and just decided that I needed to be done with the race and even at the pace that I was going at could probably get done in just over 20 minutes. I also knew that all I really had to do was run just a little more and I would hit Dayton street. Once I hit Dayton I could see the building where the road dead ends and then there a turn to the left and then state street. I knew that once I got to that turn the thousands of spectators would be there to bring me home. I had done the math in my head and figured that if I could just keep moving I could get a PR and break 12:30. I made the left turn and then the quick right turn onto state street and could see the capitol. I had envisioned this part of the run so many times on every single long training run I had gone on in the past 6 weeks. I had a huge smile and even though I knew I was running uphill (and probably still only 10 minute miles, maybe a little faster but I will never know) I felt like I was flying. The pain in my knees was irrelevant and I was loving every single second. Despite the extra speed in my run, I was savoring every moment because I knew that just as quickly as I got to that point, the day would be over. I made my way around the capitol, still grinning, still with a little blue in the sky and turned for home passing a couple of people around the capitol as I went. Arms up in the air the entire way down towards the finish line, no one in front of or behind me. Saw my parents in the chute, waved to them, and just pushed it on home. 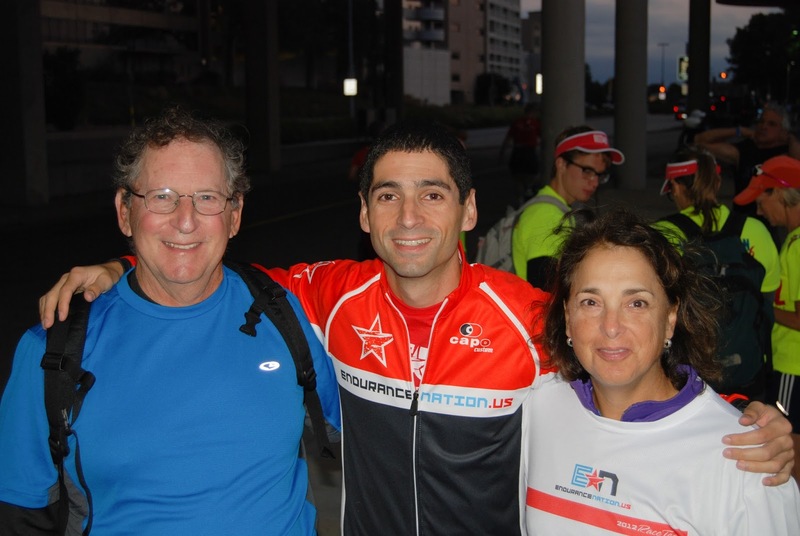 Immediately after the race I found my family, saw and congratulated several of the EN teammates and saw RnP hanging out at the finish line. I gathered my bags/bike/etc and wandered back to the hotel, continued to rehydrate and then made it down to the square to get some food and hang out with the team while watching some of the last finishers make the journey up the final mile of the race. At 11:30 a group of us wandered over to the finish line to watch the last finishers of they raced. It really was an amazing experience to be right back in the same place where this whole journey started in 2007 with my first ever visit to the finish line of a race and subsequently signing up for my first Ironman® the next morning. In the days after the race I drove back home, did some laundry, went back to work, and have been trying to let my legs loosen up. 4 days after the race I was able to successfully walk up and down the stairs in a relatively normal fashion. I’m still waking up early, but I figure that is simply due to having a body that has been trained to wake up around 5am for the past several months of training. I am very happy with my race. I adapted to some difficult conditions – the wind, some interesting numbers on the bike, and my body just hurting during the run. 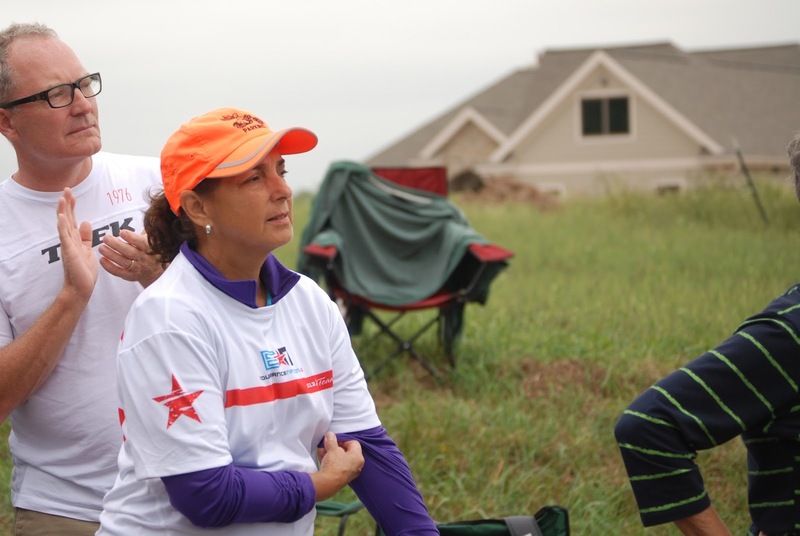 But this race is not just about getting from the start to the finish, it is about figuring out and adjusting to all of the curveballs along the way. I am so happy to have met some great people on this team at the training camps, over the race weekend, and on the internets. I have new training partners and I am looking forward to the next season of training and racing. Seeing all of the EN kits on the run was amazing, incredibly motivating, and just outright fun. So what is next? 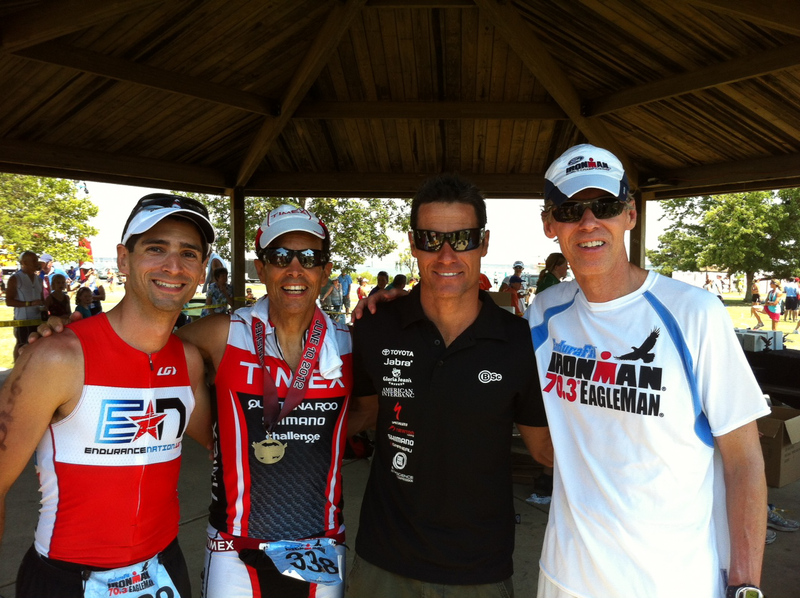 Well, I had a great race, but it can get better and this Ironman® fever has not yet been quelled. Next year will be a little different, it will be a family affair with my Uncle and multiple Kona qualifier as we both head up to Tremblant to race in Canada. After some well deserved rest, recovery, and relaxation, at some point I will get back on the bike and begin the quest to another finish line. Endurance Nation, LLC Copyright 2007 to Present - All Rights Reserved.